When I suggested this idea to Jeanne and Émilie we thought it would be fun to have my twins and Éléonore model matching outfits. They said yes immediately! 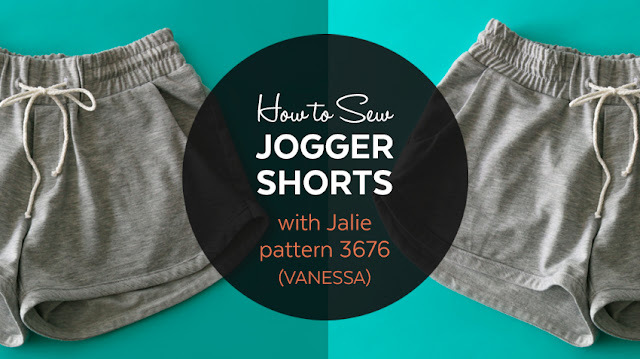 Jalie has a lot of swimwear patterns, but we took this blog tour as an opportunity to "sew outside the box". We brainstormed on the types of suits and features we were looking for and chose patterns that fit the bill. We are THRILLED with the results! I used the Violeta dress/leotard pattern as is. The dance leotard has the perfect leg cut and a nice open back for a cute swimsuit with great coverage in the front, but the open back everyone loves. For the top, I used the PIKA sport bra. I love the look of the rounded yoke/strap in the front. 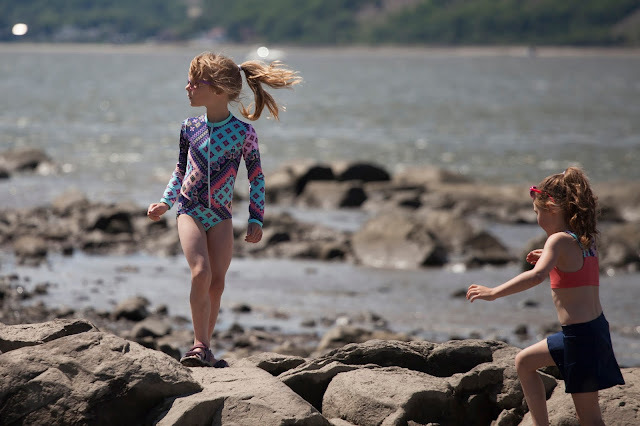 I wanted some sun protection (long sleeves), a one-piece (not a rashguard with separate bottoms), but my girly girl did not want a wetsuit look with long legs. I used skating dress pattern 2800 because it had everything on my list. I left off the mandarin collar and I looked at the VALERIE rash guard instructions for the zipper and make a neck band and added a zip guard. Also, because my fabric print was way too pretty to put a princess seam there, I taped the front pieces to remove that seam. 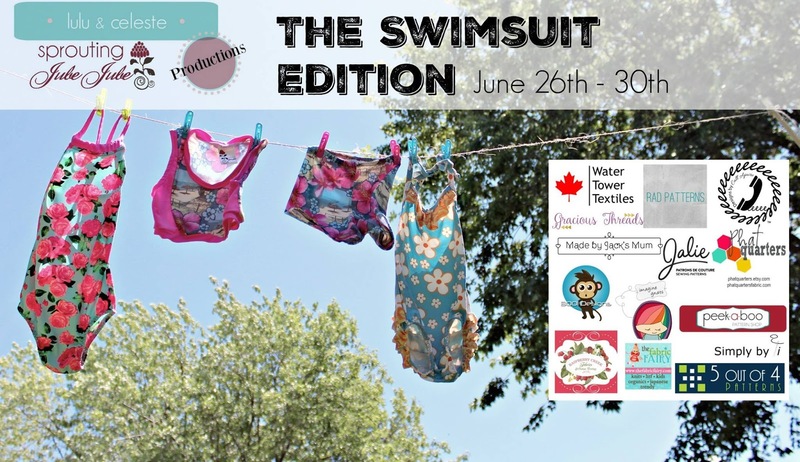 Two ways to enter: Enter the Grand Prize Rafflecopter, and/or post a swimwear item you’ve sewn on Instagram. 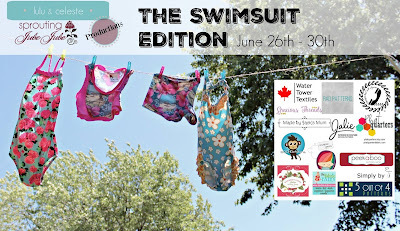 Readers can enter more than once on Instagram but must use a different photo/different sewn swim item per entry. (Ie. multiple photos of the same outfit only count as one entry). Items allowed: swimsuits and swim coverups for the entire family (women, men, children). To enter on IG: Post your photo and use the hashtag #TheSwimsuitEditionTour and tag @luluandceleste and @debzaleski in your post. Items can only have been sewn since the beginning of June 2017. Closes July 2nd 11:59pm EDT. Follow our friends along the tour! Wow! These are so good! Thank you for this inspiring post! I'm just wandering into the world of making my own swimsuits (signing up for a course on Craftsy) and I've been looking for a suit - I like the one I own which has "boy legs" (made in Canada) but I honestly think I could make myself one. I do have you shorts pattern and had thought this might work but now you've suggested so much more by looking at your skating dress patterns which I never realized had pants attached! I love all the options here! I have never sewn any Jalie but I am exited to try! Wow! you've creating such amazing looks using patterns that I bet nobody else would have thought of! love all of it!